If you are building, designing or maintaining a boat or Ship, our range of marine grade sheet products will accommodate any outdoor marine application that requires a high quality UV Polymer marine product. Boatboard - Boatboard is a special grade HDPE for use in marine environment. High density polyethylene with a special textured surface on both sides and excellent UV resistance. Uniboard - Uniboard HDPE marine ply replacement materials are low weight, very low moisture absorption, high mechanical strength, chemical resistance. Leisureboard - Leisureboard is a modified PE especially developed for applications in shapes and forms for the manufacture of innovative, colourful accessories and equipment for leisure and play related facilities. 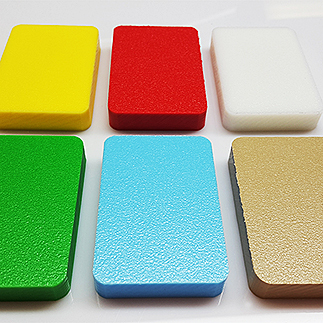 Playboard - Playboard is a co-extruded polyethylene especially developed for applications where both simple and complex shapes with vibrant colours are required. Each of these products is UV resistant and able to withstand the harsh Australian Environment. Our marine grade products are made from the highest quality polymers and have been manufactured in the US. Don't take the chance with inferior Asian imported plastic that may buckle and fade over time; your boat is worth more than that! Boatboard is a special grade HDPE for use in marine environments. A High density polyethylene with a special textured surface on both sides and excellent UV resistance. Recognised for superior flatness and low inherent stress, Boatboard sets the standard for fabrication ease among weather resistant polymer sheet products for outdoor applications. Proven uses include marine components, outdoor cabinetry and other structures. Available in standard and custom marine colours, this highly UV resistant material has a durable matte finish that cleans easily and looks great long term. Uniboard is a lightweight marine building system made from an enhanced polymer material to replace plywood, MDF and craft wood. Uniboard solid skin provides added rigidity and strength while the foamed core reduces the weight of the material by up to 30% when compared with other water soaked solid materials. With this closed cell structure, Uniboard does not allow any water absorption allowing for use in any environment indoor or outdoor. This UV stabilised product is ideal for any on-board, indoor or outdoor marine cabinetry applications. Uniboard marine ply replacement materials are low weight, very low moisture absorption, has a high mechanical strength, chemical resistance and machinability that allows this product to be used across a wide range of timber replacement applications including acoustic sheeting. Some colours available in limited quantities, please call to enquire on availability. POLYSTONE FENDER is an environmentally friendly rubber and timber alternative used for marine and harbour construction. POLYSTONE FENDER is a unique, low friction UHMWPE combining the benefits of high wear resistance with low maintenance costs. It will not rot, split or crack and is fully resistant to infestation from marine borer. POLYSTONE FENDER has a low coefficient of friction, superior impact resistance and excellent UV stability. Use for harbour construction, truck docks, floating docks boats and dredges. Ideal for the manufacture of pilings, fenders, wear pads, profiles on quay walls.